Whether you like tattoos or hate tattoos, we can all agree that as a child, the temporary tattoos that you could get out of the quarter machines were like magic. All they needed were a sponge and some water, and soon you were looking extra tough or like you just came from the coolest party with the coolest gift bags. As an adult, I have plenty of real tattoos, but temporary tattoos are still my number 1 way of looking extra tough on a budget. Recently, I found some temporary tattoos that may not be tough, but are definitely extra magical. I present Duoskin from Cindy Hsin-Liu Kao at MIT. She has actually accepted a position as an Associate Professor at Cornell, and is super rad. Give her a shoutout on twitter (@cindyhlkao). After I came across this, I was dying to try it and reached out to Dr. Kao to find out more about the process and future of this idea. I was actually surprised when she responded (read: “freaking out that somebody from MIT responded to me!”) and she was incredibly open and warm. I decided that I’d like to take her idea and bring it down to a lower level and let the students here at Steward test the concept and give feedback on the project and process. 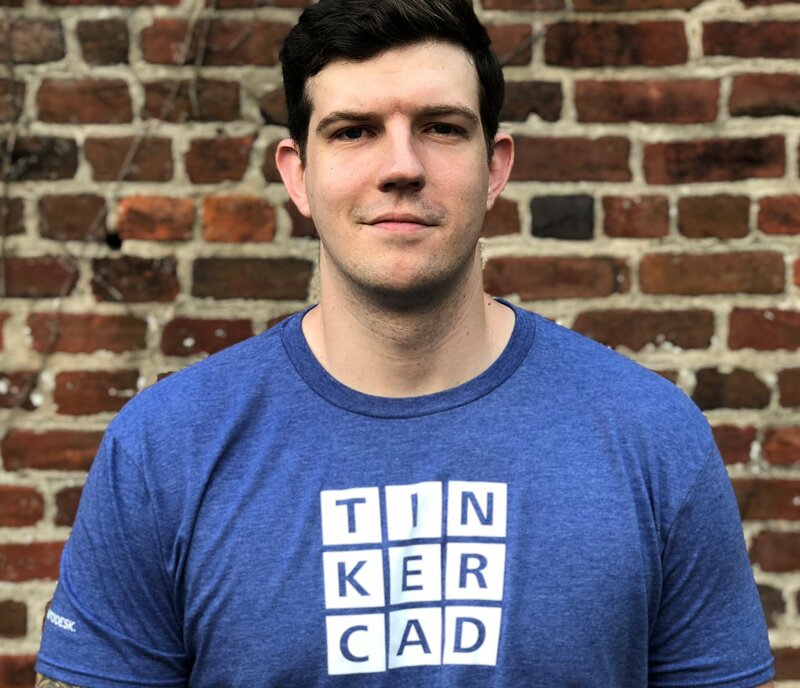 At this point, I also want to give a shout out to Alex Glow over at Hackster.io. After researching this project, I noticed she had done something similar using LilyPad parts. You can find that tutorial here. As those with a science background know, all research is peer-reviewed. This helps establish that scientific theories and methods are sound by ensuring anybody can reproduce the same results. 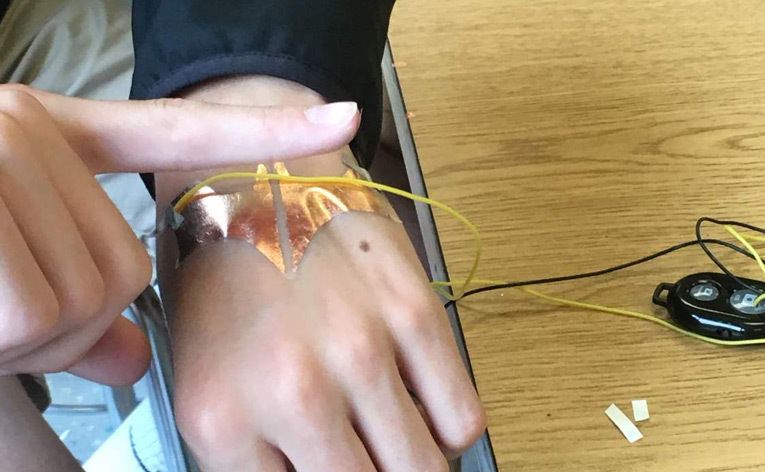 I decided that I wanted my students to get a feel for that process by using wearables. So, I decided to give DuoSkin a shot. The result? A temporary tattoo that is actually a Bluetooth camera remote. Best. Photos. Ever. This is by far one of my favorite projects I’ve ever worked on. The temporary tattoos would be made out of gold leaf, which is conductive enough to carry a current and act as a type of button. In the video, the wires are hidden from view or are very small as to not be the focal point. I described that those wires lead to some kind of device or microcontroller that sent Bluetooth/wireless signals to the computer. For our purposes, we used hacked Bluetooth remotes that use a button to take a picture. 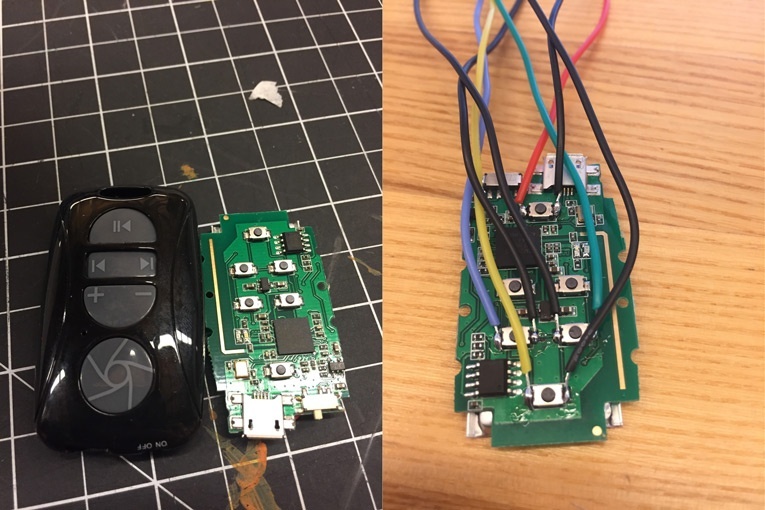 To hack this, some knowledge of circuits is required - namely how a button works. When the button is pressed down, it bridges a gap between two small electrical leads on the circuit board. When these are connected it completes the circuit, allowing the “computer” to run a process that sends a signal to your phone that says “Take a picture!.” Students were shown the remotes to be used and how simply touching the two wires would complete the circuit, simulating a button press and causing the Bluetooth remote to take a picture. Once they could see this, I rigged the wires into two triangular designs that were separated by about 1cm of space. This separation is necessary otherwise the button will get stuck in a loop of taking pictures because the circuit would always be complete. Using a finger, you can bridge the gap between the two triangles to take a picture whenever you want. No more timers necessary! Just set up the group picture, tap your forearm or hand and voila! 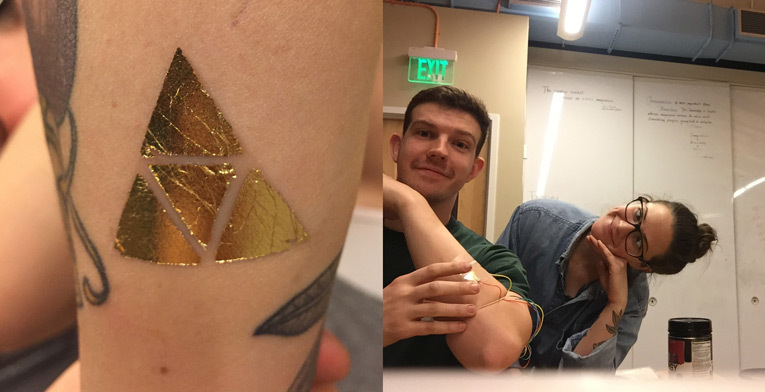 To make these gold leaf tattoos, MIT uses an automatic vinyl cutter to cut designs out that can be created in any basic program like MS Paint or Photoshop. We opted for hand drawn designs and X-Acto knives. Cutting out the design would leave one with a stencil that could be used similar to spray paint. 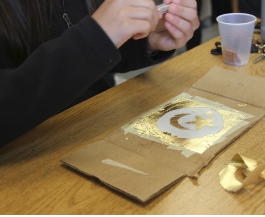 The gold leaf would be applied on top and when the stencil was peeled away, it would leave the design in gold that could be cut out and applied to the skin. We learned that simply cutting the design out of paper was not thick enough to produce a quality stencil - leading to sloppy designs that were not visually pleasing. Instead, Clear Vinyl Transfer Tape with an adhesive back was used. This also became the method of attaching the tattoo to the skin as it was cheaper than temporary tattoo paper. A visual representation is shown below. DuoSkin diagram for the students to show how to make it. I worked with over 25 art students and they all got really into the process of designing and creating and being constrained by materials. In total we used about 3 hours of time but many didn’t need that long. Some struggled with the purpose of the tattoo, some struggled with creating the right logo. Some even brought up ethics issues of using a subtle movement of your hands to take a photo if somebody doesn’t know. They snagged a few candid photos of teachers and it sparked a great discussion about technology and the speed of it. We also got to look at different devices that are starting to mimic this in the world of wearables. It’s an exciting time, they are right on the cusp of this big technology that will change their lives, and hopefully they get to become the creators of this. But most importantly, we showed the beautiful synergy of technology and art. Many like to think they exist in their own silos, but the best creations truly are a combination of the two. A Batman logo cut in half to give a gap for the circuit! In the future, I’d love to use an Arduino or micro:bit with capacitive touch sensing. The only problem is coding an app for iPhone and Android for our students to be able to download and play with. If anybody has any ideas on this, please let me know! For anyone intersted in trying this out whit their students, here are the materials I used for this project.